Based out of Sheffield for over 30 years, the company designs, manufactures, installs and services door systems for clients including BP, Shell, The Co-Op, Waterstones and House of Fraser. The company switched from a manual T-card system to BigChange’s All-in-one, Paperless Cloud based system that combines back-office CRM (Customer Relationship Management), Job Planning and Scheduling and a Mobile App for engineers and real-time tracking of vehicles. Managing Director Paul Quealey scoured the market for a technology solution that would take the business paperless and provide real-time visibility across the operation. « As our business grew, planning and scheduling work became increasingly challenging and at times it was difficult to keep track of when things were due. We looked at various systems but couldn’t find anything that was the right fit. Then we discovered BigChange; it was as if I had written the software myself. It ticked all the boxes, and the integrated vehicle tracking was unlike anything we’d seen before ». 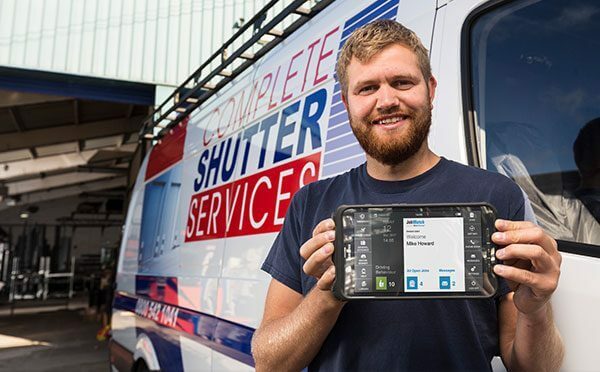 Complete Shutter Services are using an Industrial Doors specific version of the BigChange system that allows back-office users to plan, manage, schedule and track work effectively including planned maintenance and urgent reactive work. In the back-office, the system is enabling planners to respond faster to customers and is intelligently allocating work orders based on real-time engineer availability, skills, live location and parts stock. This is significantly increasing productivity; minimising customer wait time and driving first time fix at competitive cost for clients. The integrated CRM is also providing customers with a joined-up experience, thanks to automated job booking confirmations, service reminders, ETA updates on the day of service and instant access to job-cards and reports instantly after work has been completed. Complete’s mobile engineers benefit from an easy to use Android mobile app. They start their day by completing an electronic timesheet and vehicle check, before instantly accessing job information. Integrated sat-nav with live traffic ensures the best route is taken and customers receive proactive updates by text and email. On arrival, the app allows engineers to create instant estimates and guides them step by step through health & safety and job-specific workflows including photo capture. Proof-of-service is instantly relayed to the back office and the system generates fully branded job-cards that are automatically shared via a customer’s booking portal or via email.